Nava vows to take this demon down. But will life as she knows it survive this mission, or will this be the one time she should have looked before she leapt? Happily-ever-after? Barring death, she’s got a real shot at it. 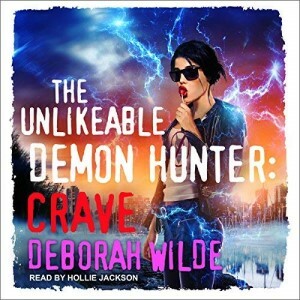 I was quite glad that most of the book did not focus on relationship drama in this edition of the Unlikeable Demon Hunter. We were able to focus mainly on the demon case to be worked as well as the outstanding case of who is binding demons. Nava and Rohan continue to look into the demon binding, trying to sort out if it is the witches or the Brotherhood that is doing it. Nava braves contact with demons that could be the very death of her to try and get information. She plays things really risky and not always to Rohan’s liking. We learn some interesting things about Nava. However, once again, Nava drops down the rabbit hole with her decisions and leaves me shaking my head. I have to remember that she is young and she is doing what she thinks is the best for her or the people she loves. She just obviously does not think her actions through which can be very frustrating. When it seems we are supposed to feel bad for Nava, I just couldn’t bring myself to, as she just brought it all on herself knowing that she is doing stuff she shouldn’t. I thought the Candyman story line was pretty interesting. It was really original. I was also really surprised by the bombshell about Nava. Those moments really kept me involved in the story. It wasn’t until Nava really goes into tstl mode that I got frustrated. Luckily it was the end of the book. The ending left me wanting to shake Nava and tell her it’s all her own fault. I just don’t feel bad for her. I will continue to listen as I really want to see what happens with the witches and the Brotherhood. The next installment is probably going to be full of relationship drama, but hopefully we’ll get enough of the demon hunting cases that it will be worth the listen. It is sad that I don’t really like the main character much, but the side characters make it worth it. I do enjoy them. I’m also really interested in the new abilities that Nava has. I’m hoping that she’ll use them wisely. Just released book 5 of my Unlikeable Demon Hunter books and it is with excitement, trepidation, and sadness that I bring it to a conclusion in book 6, which will hopefully be out in early 2019.